Tagalog for Beginners is a straightforward and user-friendly guide to the Tagalog language. 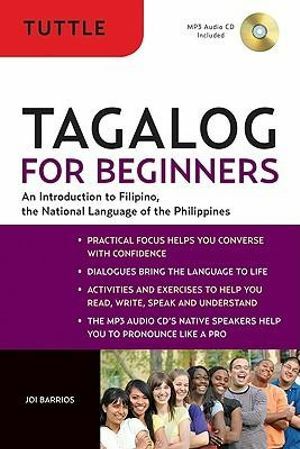 It is the book to help you learn Tagalog (Filipino) on your own, quickly and accurately--whether you're traveling to the Philippines for a vacation or a business trip, or you have ties to the sizeable Tagalog-speaking community in the U.S., or you're merely a language lover. From the fascinating history of Philippines' language to how you speak it, join skilled teacher Barrios on a guided introduction--with a practical focus. After journeying through the carefully-paced explanations, conversations, cultural info, and activities in Tagalog for Beginners, learners will be able to use Tagalog (Filipino) in a wide range of everyday situations. From shopping for food to asking directions, from telling time to expressing how you feel, this book gives you the communication skills you need. The MP3 audio-CD helps reinforce pronunciation and improve listening comprehension.